It's President's Day, and what better way to celebrate than a bunch of bloggers joining to share favorite recipes for one of our Presidents? 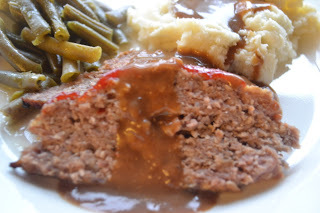 Today I am sharing President Nixon's very favorite meal: Meatloaf. and this recipe is his wife Pat's recipe. President Nixon was certainly memorable! I was a child when he was president. I remember being in first grade during his campaign to become president and kids shouting in the halls: "Nixon, Nixon, he's are man.. If he can't do it, No one can!" So funny the things you remember! I don't remember a whole lot else from first grade except I was in love with some boy named Billy, who, apparently was only interested in baseball. I wonder if I learned anything in class? Every good meatloaf maker has their own "secret" ingredients.. and probably doesn't "record" them either! Just kind of wings it. So pinning down and exact recipe for a really good meatloaf can be hard to find! "President Nixon was quite fond of his wife's meat loaf, and meat loaf appeared about once a month on the family dinner menus. As soon as the public became aware of this fact, the White House was inundated with inquires for the recipe that so pleased the presidential palate. To ease my burden, Mrs. Nixon's meat loaf recipe was printed on White House stationery to be sent in response to the thousands of requests. Grease a 13-by-9-inch baking pan. Melt butter in a saute pan, add garlic and saute until just golden -- do not brown. Let cool. In a large mixing bowl, mix ground beef by hand with sauteed onions and garlic and bread pieces. Add eggs, salt, pepper, parsley, thyme and marjoram and mix by hand in a circular motion. Turn this mixture into the prepared baking pan and pat into a loaf shape, leaving at least one inch of space around the edges to allow fat to run off. Brush the top with the tomato puree and sprinkle with bread crumbs. Refrigerate for 1 hour to allow the flavors to penetrate and to firm up the loaf. Bake meatloaf on lower shelf of oven for 1 hour, or until meat is cooked through. Pour off accumulated fat several times while baking and after meat is fully cooked. Let stand on wire rack for five minutes before slicing. Makes 6 servings."